Try these frying pans in your kitchen! Any skillet in this Wearever T-Fal 3-Piece Combo Fry Pan Set can do a splendid job of making food preparation fun for you and your family. The three sizes offer a choice in your selection of which pan to use, based on quantity being prepared and number of persons being served. Great for beginner cooks, small cooking spaces, RV or tent camping. Fry pans do not have to be for frying only, so try braising, sauteing, or boiling meats and vegetables, or just reheating canned foods. 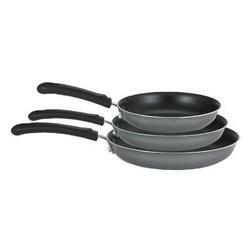 Wearever construction materials Create a durable and reliable fry pan set for use in the kitchen. Long, curved handles Provide an easy grip and keep your hand further from the heat source. Three sizes Offer versatility for choosing the correct size for preparing your favorite recipe and for cooking several dishes at the same time. Non-stick interior Makes cooking easier, food will not stick, and clean-up is a breeze. Use nylon utensils to prevent scratching.